Saying that this dish did not turn out right the first time would be an understatement. I’ve made plenty of dishes over the years that haven’t turned out quite like I had envisioned or that could use some tweaking here or there. My first attempt at this one though? Was nearly inedible. My husband bravely finished his bowl and told me it wasn’t that bad, but really? It was that bad. So why am I sharing a recipe with you that I fully admit started off as inedible? Because I ended up making it again the other night, with some MAJOR modifications and it turned out to be a pretty tasty dish! The problem with the original version and thus the key to making the new version tasty? Garlic. 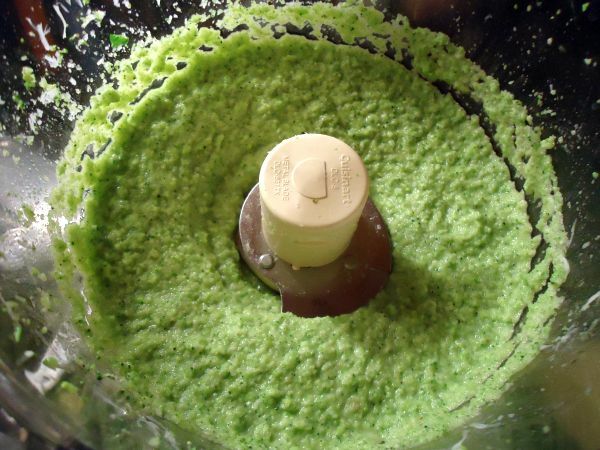 When I pureed the pesto in the blender the first time around, I added in raw garlic (not a lot, I swear!) thinking that it would be a good punch of garlicky flavor (and be mellowed out by the cheese, broccoli, etc). Well, this might have worked if it had been green garlic, or even early summer garlic. But late winter garlic? Not so much. One of my friends coined the term “death garlic” and that pretty much sums it up. It completely overpowered everything else in the dish and filled your tongue with a noxious, garlicky burning sensation. For the new version of this dish, I set half a head of garlic on a piece of aluminum foil, drizzled it with olive oil, sealed it up, and roasted it at 350 degrees for 35 minutes. Problem solved! The smell of roasted garlic is absolutely amazing, and it mellows out the flavor to the point where you almost want to just sit there eating it with a fork. Plus roasting makes the cloves pop right out of the papery skins! I made a few other changes to the original recipe as well. This time I made the pesto in the food processor instead of the blender (it made drizzling in the olive oil much easier), I added Parmesan cheese to the pesto instead of the goat cheese I used in the original version (kept the pesto thinner), and because I had them, I sauteed some mushrooms and shallots and tossed them in with the broccoli. The mushrooms turned out to make a big difference–they added a texture and savory depth that was missing from the first version of the dish. One note on the type of pasta: I used whole wheat fusilli noodles (corkscrew shaped), which worked out really well because this is a rather thick pesto. There are plenty of other shapes that would work too–I’d just recommend staying away from long and/or flat pastas like papardelle or fettuccini. They won’t work nearly as well. In the end, the new version of this dish was MUCH tastier than the original, still not very difficult to make, and something that’s definitely worth adding to your pasta and pesto repertoire. Preheat your oven to 350 degrees. Remove the outer layers of papery skin from the head of garlic. You only need half the cloves for this recipe, but feel free to roast the whole head of garlic if you have another use for it. 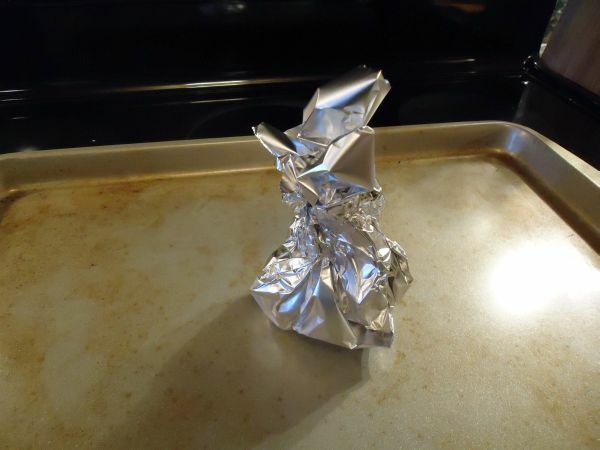 Set the garlic on a piece of aluminum foil and drizzle it thoroughly with olive oil. Seal it up, put it on a cookie sheet, and roast for 35 minutes. Meanwhile, bring a pot of well salted water to a boil. When it’s boiling, dip the crowns of broccoli in, one at a time, for 30 seconds each. (This is why the long stems are helpful–they give you something to hold on to. If your broccoli doesn’t have a long stem, just drop it in and fish it out with a slotted spoon after 30 seconds). 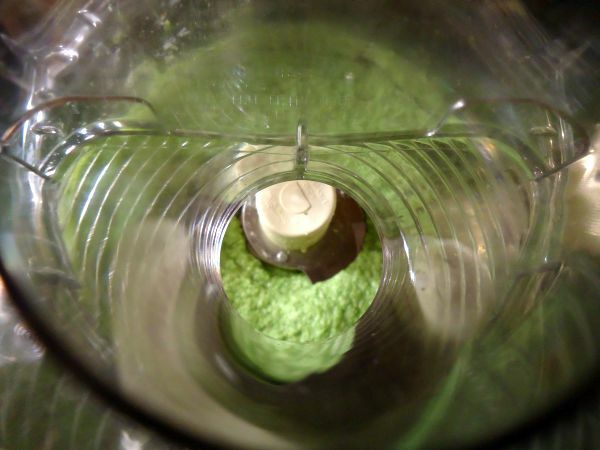 As soon as you take the broccoli out of the boiling water, run it under cold water for a bit to stop the cooking. Roughly chop two of the three crowns of broccoli and put them in the food processor. Grate in about 1/3 cup of Parmesan cheese (more or less as you desire), and add a few grinds of black pepper. Take your garlic out of the oven, carefully open up the foil pack, and remove the cloves of garlic from their skins and add them to the food processor. Pulse several times, scrape down the sides, and then let it run as you drizzle in olive oil. You want enough olive oil to thin it out into a sauce-like consistency rather than a paste, but not so much that it tastes oily. Stop and taste it periodically until you get the consistency you prefer. Salt to taste. Once the pesto is done, add the pasta to the pot of (still boiling!) water that you cooked the broccoli in. 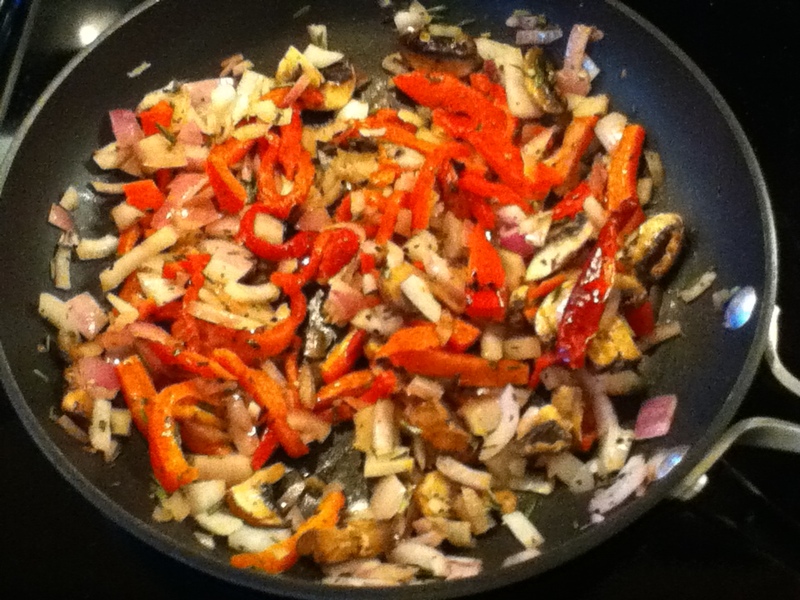 While that’s cooking, heat a bit of olive oil in a medium sized skillet and add the shallots and mushrooms. Cook for a few minutes until the mushrooms are nice and brown. 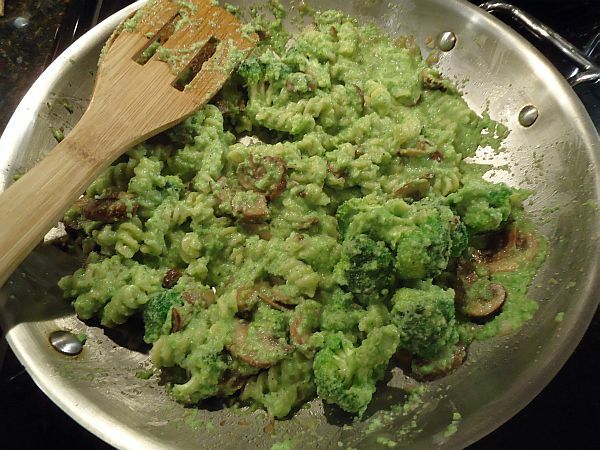 Chop the remaining broccoli into bite sized florets and add it to the skillet. Drain the pasta, and then add both it and the pesto to the skillet and toss everything together. Once everything is well coated in pesto, take it off the heat and serve garnished with a bit more freshly grated Parmesan and/or a squeeze of lemon juice. Enjoy! Hi, everyone! I am FINALLY back on my blog after several months of radio silence. I’ve been away on campus teaching for the semester, and while I had originally intended to continue posting, there’s not much to say when your primary instrument of cooking is a microwave. (If you were wondering, it is possible to successfully make pasta, beets, potatoes, and a variety of other things in the microwave. But after a while you get lazy and just buy a lot of boxes of soup.) I am super excited to get back to blogging, and I have some awesome recipes coming up including a butternut squash dish, a cake, a salad, at least one type of cookie, and, the subject of today’s post: mushroom barley soup! It takes forever to cook. Oh, the pearled kind cooks up in a perfectly reasonable amount of time, it’s true. But pearled barley doesn’t have nearly the nutritional punch that hulled has, plus it doesn’t have quite the same pleasing, chewy texture. Solution: slow cooker. With a minimal amount of planning ahead, I pre-cooked the barley overnight in the slow cooker, so that when it came time to make the soup, all I had to do was throw it in. And it’s so easy to make barley in the slow cooker, you can do it while you’re sleeping. Literally. If you cook it on low, it’s ready in 6-8 hours max, which means that this is also an excellent way to replace your breakfast oatmeal with breakfast barley. And in fact, I ended up with more cooked barley than I needed for the soup, so I had ready-made breakfast for the rest of the week! The night before you plan on making the soup, get out your slow cooker and put in one cup of dried, hulled barley and 4.5 cups of water. Give it a stir (and pick out any bits of chaff that may have been in with your barley), cover it, and set it to low for 8 hours. In the morning, scoop it out, put it in a container, and pop it in the fridge until you’re ready to make the soup. When you’re ready to make your soup, take your dried porcini mushrooms, put them in a small bowl, and cover them with hot water. Let them steep while you get everything else going. 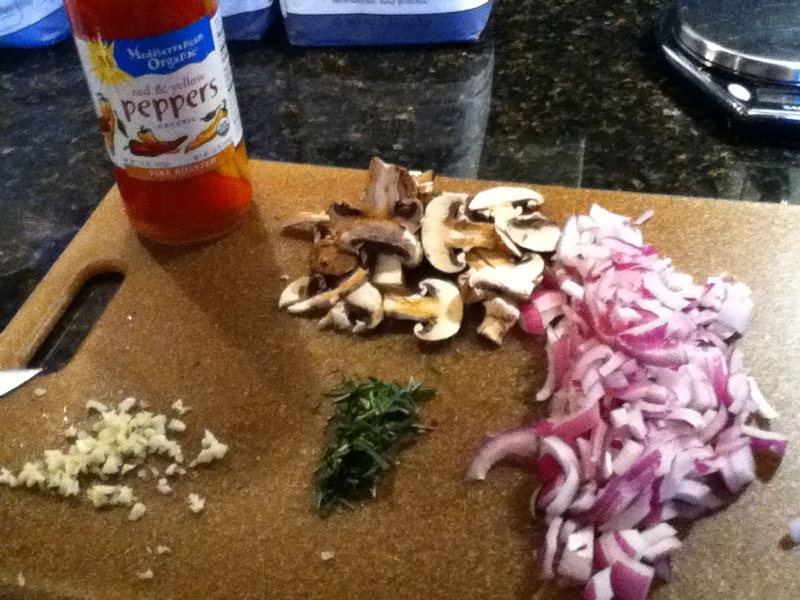 The water should turn a rich shade of reddish-brown, and the mushrooms will re-hydrate. Meanwhile, in a large stock pot or dutch oven, melt two tablespoons of butter over medium-high heat. When the butter is melted and the pan is hot, add in the diced onion and garlic, and saute until the onion starts to get transparent. Then add the sliced mushrooms, and continue to stir occasionally until the mushrooms start to darken. Deglaze the pan with the white wine, and let it simmer until most of the wine has cooked off. Chop up the re-hydrated porcini mushrooms and add them to the pan, and strain in the liquid they were soaking in. Add the mushroom broth, beans, and as much of the barley as you would like in your soup (more if you want your soup thicker like a stew, less if you want it more soup-like), and the kale. Cover, and simmer until the kale has completely wilted. 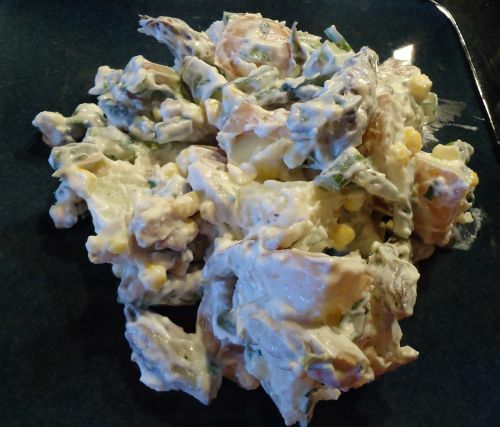 Stir in the sour cream, and then add salt and pepper to taste. It will probably take more salt than you think you need; just add it a little at a time. 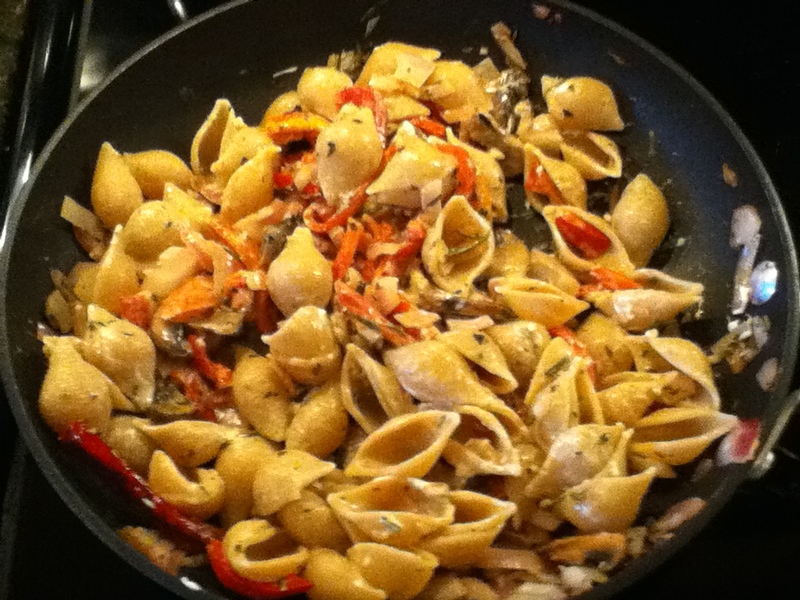 Ladle it into bowls, top with Parmesan cheese, and enjoy! It’s been too long since I last posted. My time has been consumed with far too many books and not nearly enough cooking. But at last I have survived my general exams and have time to get back in the kitchen! I have a couple new recipes to write about, but I decided that this one needed to come first so that I wouldn’t forget what I put in it! It was very much a make-it-up-as-you-go-along type of dish. I bought the kale and mushrooms knowing that I wanted to put them with white beans, but aside from that I had no idea where I was going to go with this! I ended up going in a garlicky, nutmeggy, peppery direction–because there was so much kale, the spices didn’t always get evenly mixed in, leading to bursts of different flavors in different bites. If you want a more uniform flavor, it would probably be best to add all the spices prior to adding the kale to the skillet. Speaking of the kale, you could really substitute any leafy green you like in this recipe–swiss chard, beet greens, lacinta kale or red kale would all work well. Another addition that might be nice is bacon–if you fried the bacon in the same skillet with everything else, you could omit the butter and just use the bacon grease. Bacon makes everything better, and gets along well with both beans and kale, but alas, it’s obviously not vegetarian-friendly. If you do make this with bacon, though, let me know how it goes! Soak your beans overnight, or at least for an hour or two prior to cooking. (If using canned beans, simply rinse them off and skip the next few steps.) Rinse off your soaked beans in cold water, and then put them in a medium-sized pan with enough cold water to cover them by at least half an inch to an inch. Bring the beans to a boil, and then reduce the heat and simmer them until tender. Keep an eye on them so they don’t boil over! When your beans are almost done, put your largest skillet on to heat up over medium heat. Once it’s hot, add a glug or two of olive oil, and then add the onion and celery. When the onion is transparent, add a good splash of white wine, the bay leaf, thyme, oregano, and garlic flakes. (This is not an exact science–just put in a good shake of each). Stir everything around, and let the wine cook off. 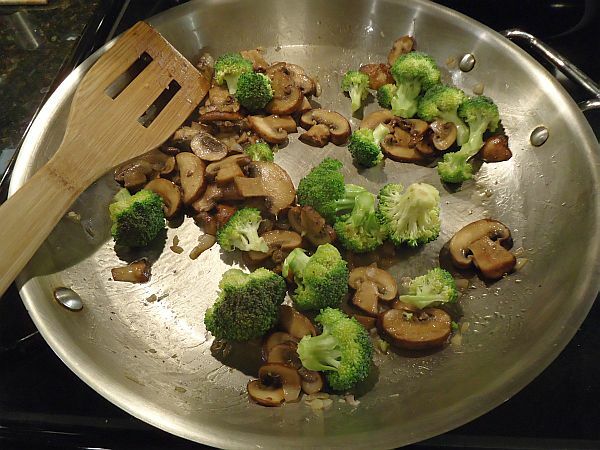 While that’s going, slice up your mushrooms, and when the wine is almost gone, add the mushrooms to the skillet. While those are going, you can wash and chop the kale. Once the mushrooms have started to brown, drain off any water that was still in with your beans and add them to the skillet. (Or add your canned and rinsed beans). Add the nutmeg, salt, pepper, and red pepper flakes, as well as the butter. Once the butter is melted, add the kale. It will seem like a lot of kale, but it will lose a lot of volume as it cooks down. 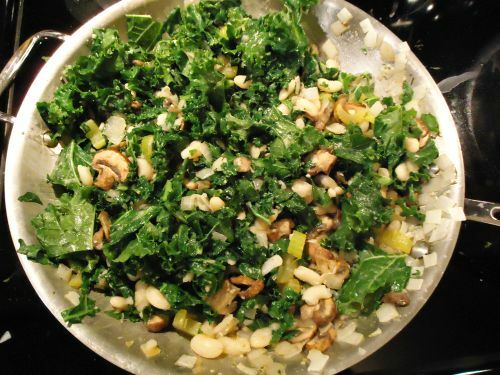 Once your kale is cooked down, make sure everything is mixed thoroughly and taste your dish. Adjust the seasonings according to taste, take it off the heat, and top it with freshly grated Parmesan cheese. Enjoy! At long last, the Thanksgiving post has arrived! Thanksgiving has always been one of my favorite holidays, but I’ve come to appreciate it exponentially more in recent years, partially because I’ve gotten more into cooking, but also because I spent three Thanksgivings in a row (2006-2008) outside the US. In 2008 I did get to attend the US embassy potluck Thanksgiving, which was fabulous and full of delicious food, but now that I’m back in the US, I’m just so thankful (no cliche intended!) that I get to spend Thanksgiving with my family! As has become the tradition recently, we had two Thanksgivings this year. The first was at my parents’ house and had nearly 20 people in attendance (so many cousins!). The second? I hosted! Since my fiance and I have a big table and a nicely functional kitchen (unlike the teeny kitchen we were working with in his apartment last year!) I thought it would be lots of fun to have both of our parents plus his sister and her husband over for Thanksgiving. I had never made a turkey before. I had never cooked that many dishes all at once before. This had great potential for disaster. In the end, mistakes were made, there were a few things that didn’t make it onto the table for various reasons, and the timing wasn’t perfect, but no one went home hungry, I didn’t light anything on fire, and nothing turned out to be completely inedible. So I’d say it was a success! And now you can learn from everything I did wrong and do much better than I did the next time you host a major gathering! Part 1: Overall Tips: Start in advance. Way in advance. Like…a month or two in advance even. Your freezer is your friend for many things, from roast pumpkin and squash to cranberry sauce. 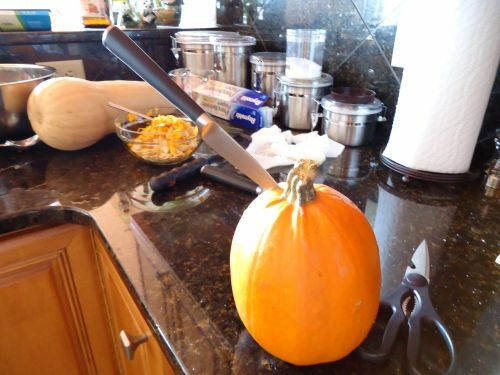 So don’t, for example, stress yourself out by trying to roast the pumpkins for pumpkin pie two days before Thanksgiving, because you will inevitably be stuck with a stubborn pumpkin that does NOT want to be cut open. (More on that later). Save yourself the headache, and roast your pumpkins in October, puree the flesh and then freeze it, leaving yourself free to make stress-free pumpkin pie from scratch. 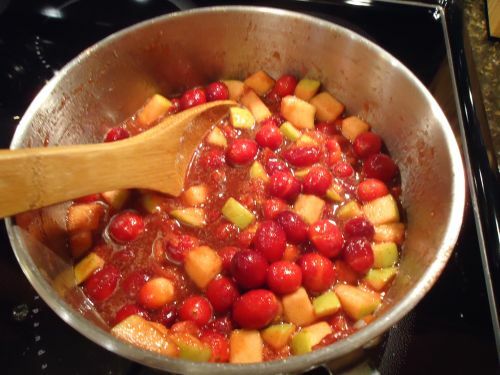 Same for cranberry sauce–make it in early November and freeze it. Applesauce too. And if you happen to be making coconut butternut squash soup, freeze that too! Just don’t freeze your mashed potatoes. Those are better fresh. Another tip: get a cooler to use as a temporary spare refrigerator. It is likely while you’re in the process of preparing all these dishes, that you will run out of refrigerator space. We were lucky that it was just barely cold enough to keep some things outside, but if you live in a warmer climate or the weather is unseasonably warm for late November, you will want a cooler with ice in it for overflow refrigeration. 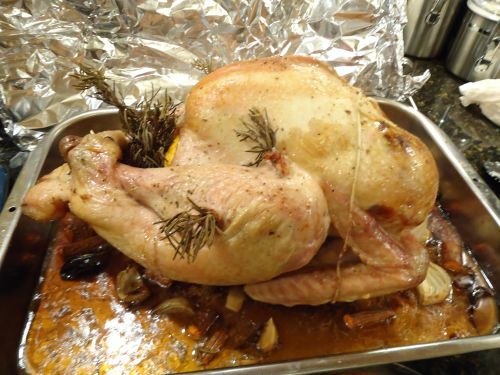 Turkey – I bought a 12lb organic bird. I had wanted a 10lb turkey, but I didn’t know until it was too late that you can pre-order your turkey from the grocery store. I bought it fresh, four days before Thanksgiving. Its sell-by date was the day I bought it–I was a little concerned, but it was fine. But I’d definitely say pre-order your turkey if at all possible.A note on turkeys–obviously not everyone can afford or even find organic turkeys. So if you can’t, and if you don’t hunt your own wild turkeys (I certainly don’t! ), then at least aim to get one that is a) under 14lbs or so (have you seen those 25lb turkeys?? They’re so breast-heavy they’d tip over! Just get two if you need to feed more people) b) natural, as in it hasn’t been treated with all manner of antibiotics and chemicals, and hasn’t been injected with weird stuff and isn’t self basting. Once you’ve got your turkey, for the love of all that’s holy do not just set it in your refrigerator!!! Put a large plate or platter under it at the very least, or better yet set it in the roasting pan. It WILL leak. You don’t want to know how long it took me to scrub out our fridge. If you’re going to brine your turkey, keep in mind that it takes quite a long time (8-16 hours), so plan accordingly. I didn’t brine mine this year, but maybe next year! Assuming you’re doing what I did, on Thanksgiving morning, take your turkey out of the fridge and move it over to the sink. It should be thawed by this point if it was frozen. Make sure you’ve given yourself enough time! You’ll want about 2 hours of prep time (this is generous, but you never know how long it’s going to take, especially if you’ve never done it before!) and you’ll want to make sure you have enough time to roast the bird. Turn on the cold water, and start washing your turkey, inside and out. Make sure you take out the neck and giblets. And please do us all a favor and throw the giblets away. Unless you really like organ meat and know how to cook it, neither of which are true for me. Just make sure you don’t do what I did and throw them in a pot to try and make some sort of stock. You’ll just end up stinking up your entire house. It’s *really* hard to get rid of that smell.Anyways, rinse your bird thoroughly, and check it for unplucked feathers. It likely will have a few, and if it’s an organic bird, possibly more than a few. You especially need to make sure to check the armpits and crevices by the legs. Once the turkey is all clean, pat it with some paper towel and set it in your roasting pan. Now you’re ready to stuff/season/flavor/otherwise prepare the bird so that it comes out juicy and delicious! This is where a recipe can definitely come in handy. I used Jamie Oliver’s turkey recipe which was definitely a good choice. The turkey came out moist and tender–it’s true what they say: bacon makes everything better! I did find it rather difficult to get the pancetta wrapped rosemary skewers into the thigh, and I ended up only doing two per thigh unlike the 6 he recommends, but I found that by poking a hole with a knife, and then widening it with my finger, I could shove the pancetta in there first, and then pin it in place with the rosemary. Just try not to make the hole too big–the skin needs to be mostly intact to keep the juices in. The other key point of his recipe is to stuff the turkey breasts. Even if you’re not making his exact recipe, you should totally do this! It’s a little tricky to get your hand up in there, but that was the moistest, juiciest turkey breast I’ve ever had. Mashed potatoes – Not much to say here…mashed potatoes are tasty. And easy. Just keep an eye on them so they don’t boil over. 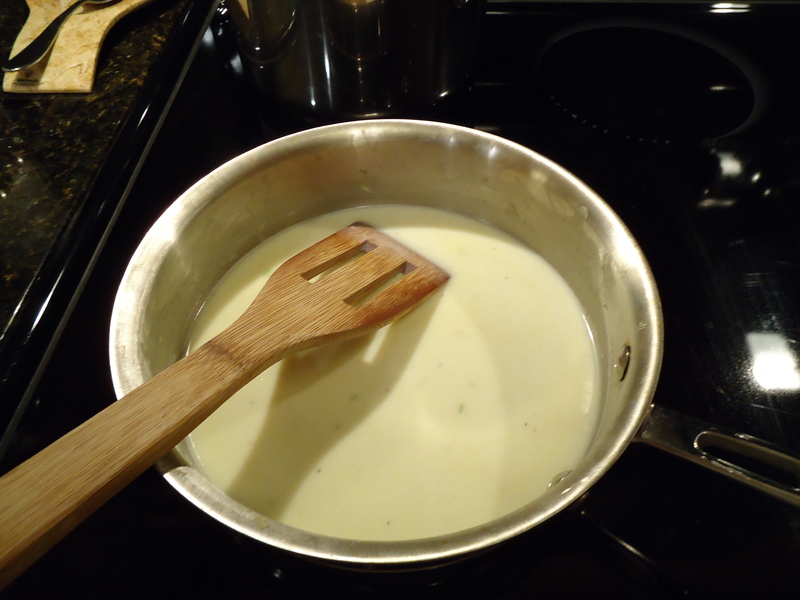 Mushroom gravy – Since my fiance is a vegetarian, I made mushroom gravy instead of gravy from the drippings. It’s really easy to do, and plus you can do it earlier in the day so you won’t be scrambling to make gravy while your turkey is resting and your guest are arriving. I’ll put the recipe down at the bottom of this post. Stuffed onions – I decided that for the vegetarian stuffing, I would make Smitten Kitchen’s stuffed onions. The stuffing inside of these onions? Delicious! The onions? A giant pain in the neck. She’s right that a melon baller is definitely the appropriate tool for hollowing out an onion, but if you’re making 10-15 of these, unless you have onion goggles, your eyes will be burning for the rest of the day. And you will stink like onions for quite some time thereafter. Still determined to make them? Hollow them out as much as you possibly can without punching a hole in the side–if you can get it down to one layer of onion? Awesome. And make sure you pre-roast the onions long enough before stuffing them. I was a bit rushed for time, and I don’t think they went nearly long enough–and you really don’t want that raw onion flavor, especially if you, like me, were unsuccessful in scooping out all but one layer of onion. Sausage stuffing – I made the stuffing from Jamie Oliver’s recipe, but sadly, this was one of the things that didn’t make it onto the table. I had put the leftover stuffing that wasn’t in the turkey into a casserole dish and stuck it in the oven, but I don’t think the sausage managed to cook through. It is currently in the freezer, waiting for me to toss it in a skillet to turn it into something else. Green bean casserole – The stereotypical dish that can be made entirely from canned goods! Blech! Make it from scratch. Blanch your fresh green beans for three minutes (less if they’re not very tough), toss them in a casserole dish with homemade cream of mushroom soup (I used Smitten Kitchen’s recipe) or just use some of your mushroom gravy, and top it either with panko breadcrumbs or make your own crunchy onions. But since crunchy onions roast at a much higher temperature than turkey and I only have one oven, alas, I had to forego the crunchy onions. Sweet potato cranberry bake – My fiance got this recipe from a coworker and can I just say–yum! Chunks of tender sweet potato (the real stuff! the canned stuff is nasty! ), tart bursts of juice from the fresh cranberries, and a crunchy, sweet oatmeal and brown sugar topping! Kale and apple salad – Just what it sounds like, and with a lemon vinaigrette dressing and some walnuts on top. You’ll want to blanch the kale a little bit to make it less tough, and you can do this ahead of time–just make sure you have an ice bath ready for it, because you don’t want mush! Cranberry apple chutney – This is one of those things that is super easy to make but looks really impressive in the end. All you really do is simmer fresh cranberries and a granny smith apple with some spices until the cranberries pop and the sauce thickens. It’s good by itself, on a leftover turkey sandwich, or on crackers with a bit of goat cheese! 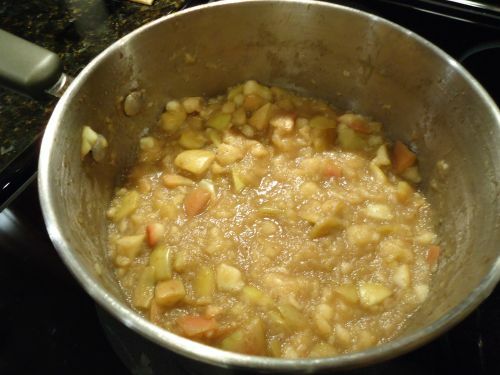 Applesauce – If you, like me, bought an absurd number of apples at the farmer’s market, make applesauce! I don’t bother peeling the apples–I just cube them and toss them in a pot with a little water (only enough to cover the bottom layer or so of apples), ground cinnamon and cloves, and a bit of allspice. Cook it down until the apples are mushy, add a little brown sugar if it needs it, mash it all up, and there you go! Coconut butternut squash soup – This time around I had a 6lb butternut squash. It was absurdly huge. But in fact, the ratio of 6lbs of butternut squash to two cans of coconut milk makes a delightfully textured soup that actually deserves to be called soup and not a puree. Fresh grated ginger as opposed to ground also adds a nice dimension of flavor. I do now have a lovely pair of pumpkin shell bowls! The shell stayed super hard, even after roasting for 45 minutes! In addition to all the dishes mentioned above, my fiance (the baker in this relationship!) baked three loaves of French bread and an apple pie. Yum! Put a saucepan on the stove over medium heat and add 1tbsp of the butter. Let it melt and start to sizzle a bit, and then add your mushrooms. Cook them until they’re nicely browned and then remove them from the pan and set aside. In the same pan, add your remaining two tablespoons of butter, and when it’s melted, add the flour. Stir until it forms a thick paste, then add your mushroom broth. Reduce heat and stir more or less constantly until your sauce starts to thicken. Then add the mushrooms back in, and cover it and keep it warm on the stove until you’re ready to use it, stirring occasionally. We hit up the farmer’s market on Saturday and got a whole bunch of delicious fall ingredients which will be turning up in my posts as the week goes on. Acorn squash, turnips, leeks, serrano chilies, and some really fabulous looking oyster mushrooms, which are the subject of today’s recipe. 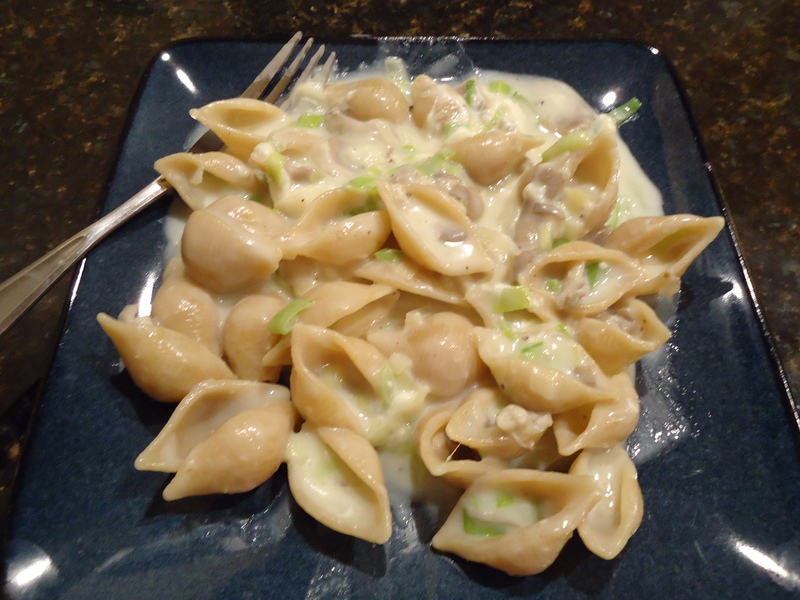 Never having cooked with oyster mushrooms before, I wasn’t quite sure what to expect flavor-wise, so I decided to make a cheesy cream sauce with leeks and the mushrooms and serve it over pasta. I started by sauteing (did I spell that right? 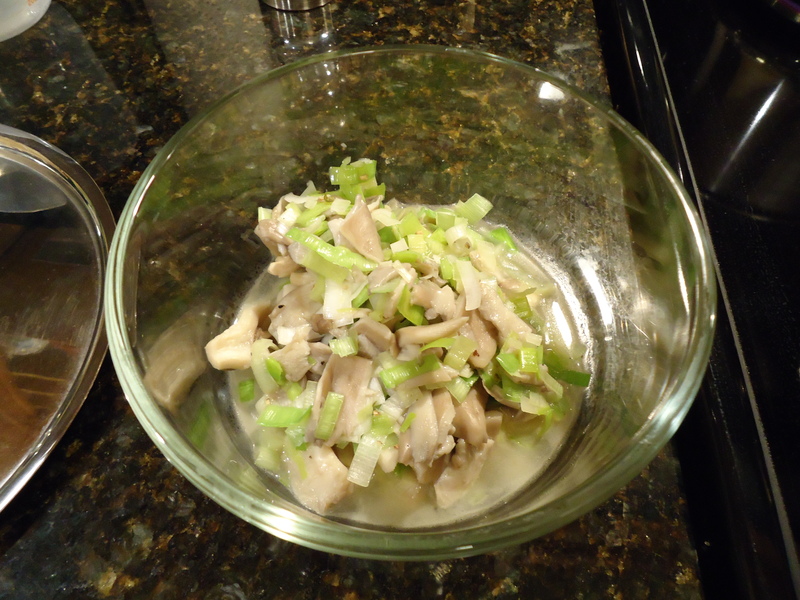 I never know…) the mushrooms and leeks in some butter with a bit of salt and pepper. 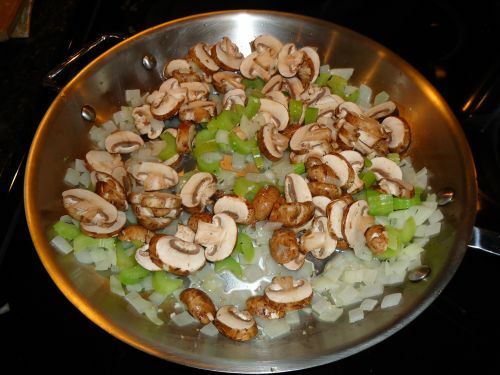 When the leeks started getting soft, I took the pan off the heat, dumped the leeks and mushrooms in a bowl, and then added another tablespoon of butter and a tablespoon of flour to the same pan to start the base of the sauce. (aka a roux. I watch too many cooking shows.) Once it was all melted and combined I added 3/4c of milk and started stirring to get all the lumps out. Once it just started to bubble, I reduced the heat and simmered it, still stirring, until it thickened up. Then I added the leeks and mushrooms back in, added some fresh mozzarella, some freshly grated parmesan, some more salt and pepper, and it was good to go! I have to say, it turned out well, but in retrospect oyster mushrooms were probably not the best choice for this dish. 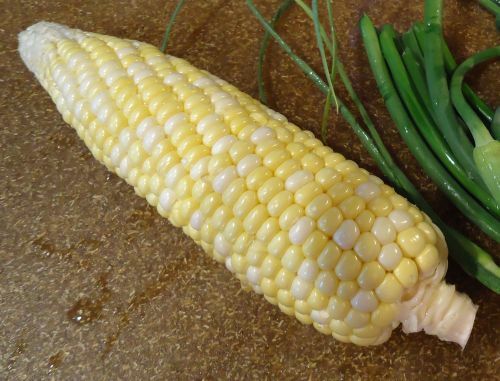 Their flavor is so mild that they kind of get lost, even under the super mild flavors of leeks and cheese. You’d probably be better off using mushrooms that are a big more…mushroom-y like criminis or even some bunapi shimeji. Put a pot of salted water on to boil for your pasta. Meanwhile, split the leek lengthwise and then wash it thoroughly to get all the grit out from between the layers. Give your mushrooms a quick rinse too, and then dice them and the leek. Heat up a medium pan on the stove and add 1/2 tbsp of butter. When the pan is hot and the butter is melted, toss in the leeks and mushrooms, add a bit of salt and pepper, and saute over medium heat until the leeks just start to soften a bit. Transfer the leeks and mushrooms to a bowl and set aside. In the same pan you’ve been using, add the remaining tablespoon of butter along with the tablespoon of flour. Stir over medium heat until the butter and flour are fully incorporated, and then add the milk. Stir the mixture as you bring it to a boil to get all the lumps out. Once it starts to bubble, reduce the heat and simmer it til it thickens, still stirring so it doesn’t burn on the bottom. Once the sauce is thickened, add the leeks and mushrooms back in, along with some fresh mozzarella (as much or as little as you want. Also, make sure the mozzarella isn’t *too* fresh–you want it to have some flavor to it. ), some freshly grated parmesan, and more salt and pepper. Stir together over low heat until the mozzarella is melted and then toss it together with your pasta, serve, and enjoy! My fiance was having a guys’ night out the other night so I was left to fend for myself for dinner. There was no food in the fridge, so I had to run to the grocery store to find something to make. I wasn’t really in the mood to flip through cookbooks, so I decided to just let inspiration strike when I got there. Looking around, the produce looked good, but there wasn’t really anything I wanted to eat until I saw the pea shoots. I discovered pea shoots earlier this spring. I was at a dinner at an Italian restaurant and my entree came with pea shoots garnishing it. It was love at first taste. They’re delicious! So when I saw them at the store today, I knew I had to buy them. From there it was just a matter of figuring out what to put with them. I grabbed a few crimini mushrooms, a bag of frozen peas, and then I realized that since I was only cooking for myself, I could have meat! (My fiance is vegetarian, and normally I’m perfectly content to eat vegetarian food, but lately I’ve been wanting to use some meat in my cooking.) I looked around, and found organic spinach and feta chicken sausage. It looked delicious and only had 120 calories! Obviously I bought it. This dish was really easy to put together. Since the sausage was pre-cooked, all I had to do was heat it up. I put the mushrooms and sausage into a dry, non-stick pan on “medium” heat (though who can say what that really means on an electric stove!) and tossed everything around until the sausage was sizzling nicely and the mushrooms were browned. Meanwhile, I had water boiling on another burner and cooked a serving of brown rice pasta. I used shells, but you can use whatever you have handy. When the pasta was almost ready, I tossed in the frozen peas (which had been sitting on the counter and were thus not entirely frozen anymore) and then drained the whole mix. I put the pasta and peas on a plate, cut the sausage and added it and the mushrooms, added salt, pepper, and a little freshly grated Parmesan cheese, and then topped it all off with a good handful of the pea shoots. The flavor of the sausage kept this dish from needing too much other seasoning, but if you’re making a vegetarian version, play around with different spices, and also add a bit more cheese. Bring a pot of salted water to a boil and cook pasta according to package instructions (the brown rice pasta I used takes longer to cook than other varieties). Put frozen peas in a bowl on the counter to thaw. Use as many or as few as you like. Chop up the mushrooms, and then put them and the sausage in a dry non-stick pan on medium heat. Rotate the sausage periodically to ensure even cooking, and stir the mushrooms frequently to avoid burning. When the pasta is almost done, dump in the peas. When the pasta is al dente, drain and put on a plate. Cut up the sausage, and add it and the mushrooms to the plate. Add salt and pepper, and toss everything together. 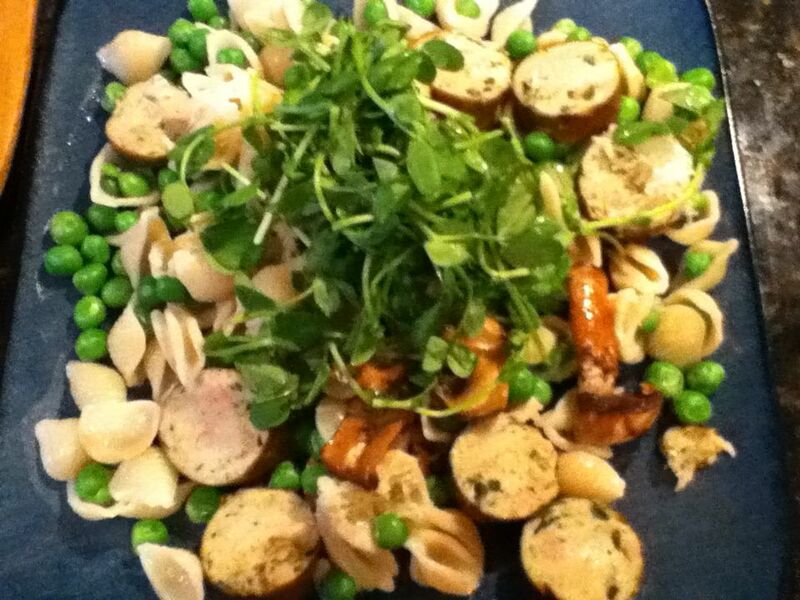 Top with a little grated Parmesan and the pea shoots. Enjoy! The other day I decided I wanted to make a variation on one of the first recipes I ever invented for myself. Several years ago, when I was living in Armenia, I would go almost every day to the street vendor around the corner to buy fresh fruits and vegetables. 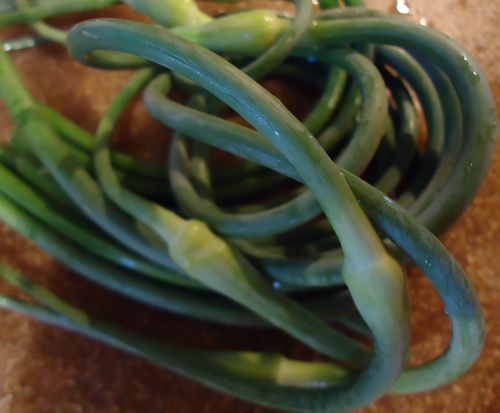 In the spring, when the boxes of produce started to be full of things other than apples and potatoes, the first yellow squash started to appear, along with green garlic (which is milder than mature garlic without losing the rich, garlicky flavor). For the next couple of weeks, I started making variations on the theme of stir fried squash, green garlic, and cheese, throwing in whatever other vegetables happened to look good that day. Since it’s spring again now (well, technically summer but you’d hardly know it by the weather! 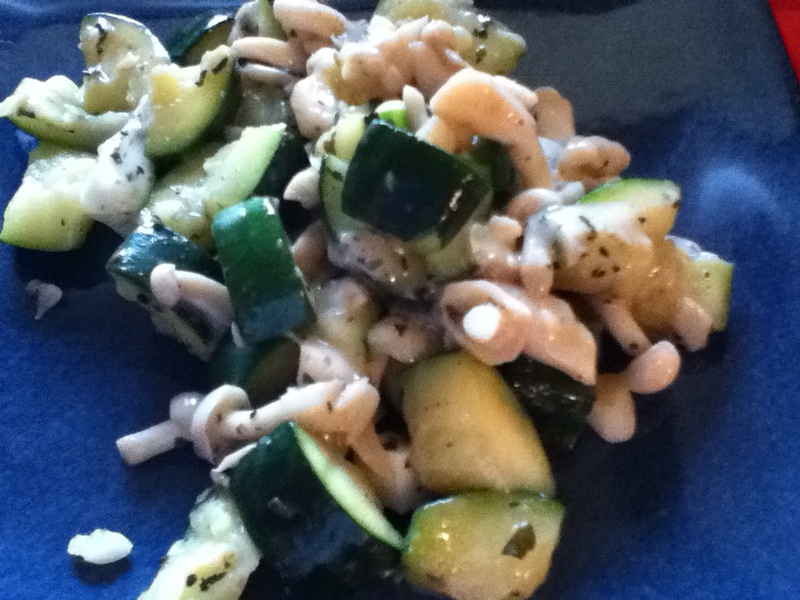 ), I wanted to revisit this dish and see if I could recreate it. Because of the cold spring, I haven’t seen any summer squash anywhere yet, so I bought (Mexican) zucchini, since zucchini and yellow summer squash usually have a fairly similar texture and flavor. I also did manage to find some young garlic which, while it wasn’t quite green garlic, at least it wasn’t sprouting yet. And then I came across these. 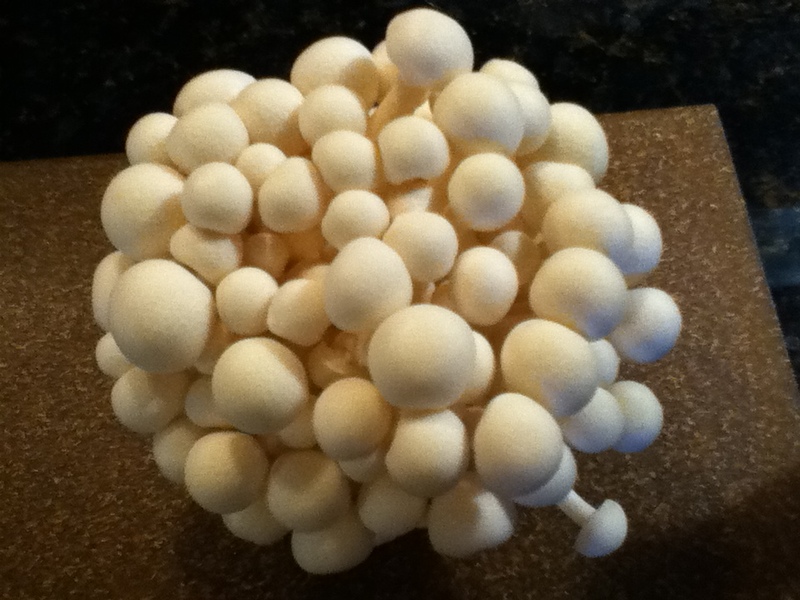 Bunapi shimeji, also known as white beech mushrooms, are a Japanese variety of mushroom that are extraordinarily cute and while raw, rather impressively stinky. According to the Wiki article linked above, you shouldn’t eat them raw, and I can’t honestly see why anyone would. Cooked, however, they lose the stink and become quite pleasantly flavored mushrooms. Cooking this dish is straightforward–it’s a one pan stir fry, so after chopping all the zucchini, mushrooms, and garlic, I just dropped them in the skillet with some olive oil, salt, pepper, and oregano and fried them up. After several minutes, I put the cover on and turned down the heat just to get the zucchini a little softer. Meanwhile I cut up some brie, and once the veggies were done, I tossed them in a bowl with the brie, stirring until it melted. And that’s it. 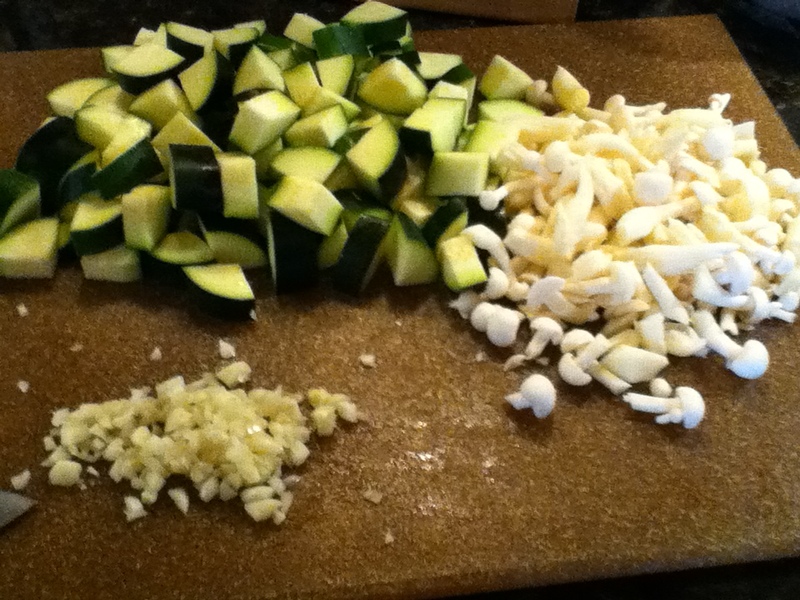 Dice your zucchini and roughly chop the mushrooms and garlic. Pour the olive oil in the skillet and put it on the stove on medium heat. 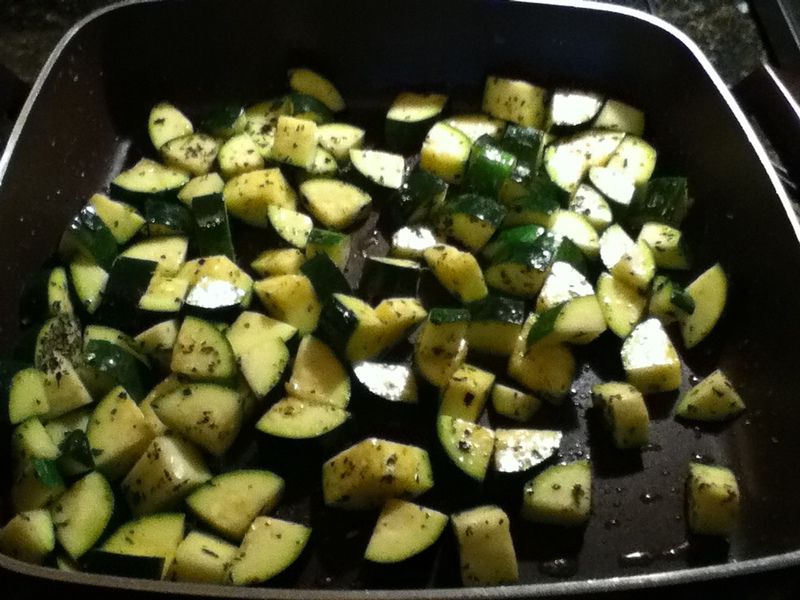 Once it’s warm, add the zucchini, as it will take the longest to cook. Season with salt, pepper, and oregano. Once the zucchini just starts to soften, add the mushrooms, and continue to cook for a few more minutes. Turn down the heat, cover, and let it simmer for another minute, until the zucchini is soft but not mushy. Taste, and add more salt and pepper if necessary. Transfer everything from the skillet to a bowl and add the brie. 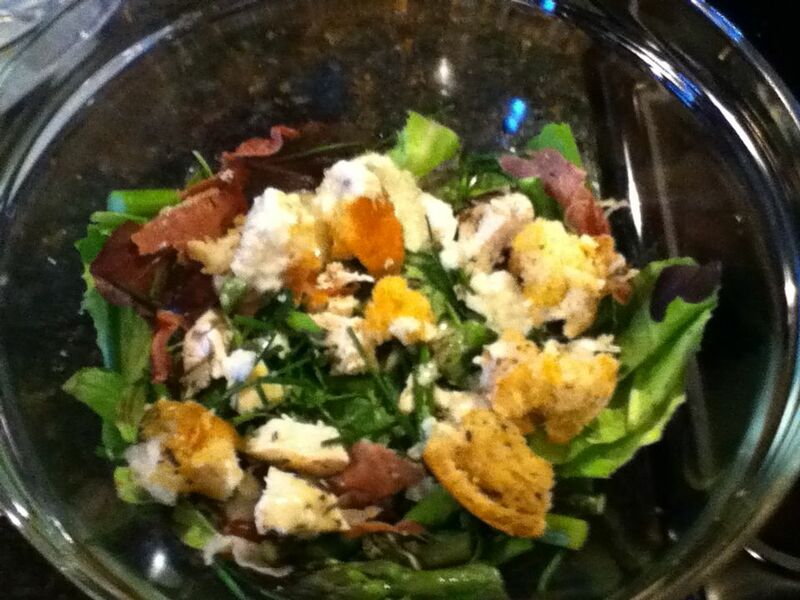 Mix well until the brie is melted, and serve immediately with toast, croutons, bacon, or raw veggies. Enjoy!